On a warm and sunny Thursday morning, I made my way to the Norwich office of the British Trust for Conservation Volunteers (BTCV for short). I left my flat for the bus stop with plenty of time to arrive, but somehow I managed to get lost among the twisting and windy streets to the south of City Centre. Finally, I gave up and called the office to ask for directions. Tom was kind enough to find me a few yards away from the pathway that lead to the entrance, which was hidden behind thick brush. After signing a few forms, I made my way through the office to introduce myself to the other volunteers. BTCV is a voluntary organization focused on conservation and education about environmental sustainability. Volunteers help to maintain parkland for public enjoyment, as well as working on landscaping tasks that raise funds for conservation efforts. In addition to working with volunteers who have learning disabilities, the trust offers career placement and volunteer opportunities for youth and the long-term unemployed. At 930, ten other volunteers got into a van and headed toward the western end of the Bowthorpe housing subdivision, not far from the UEA village. Our task was based in a marshland that was purchased for preservation by the property developer, as a condition for the construction of the development. That day, our objective was to heather a fence along the edge of the marshland. 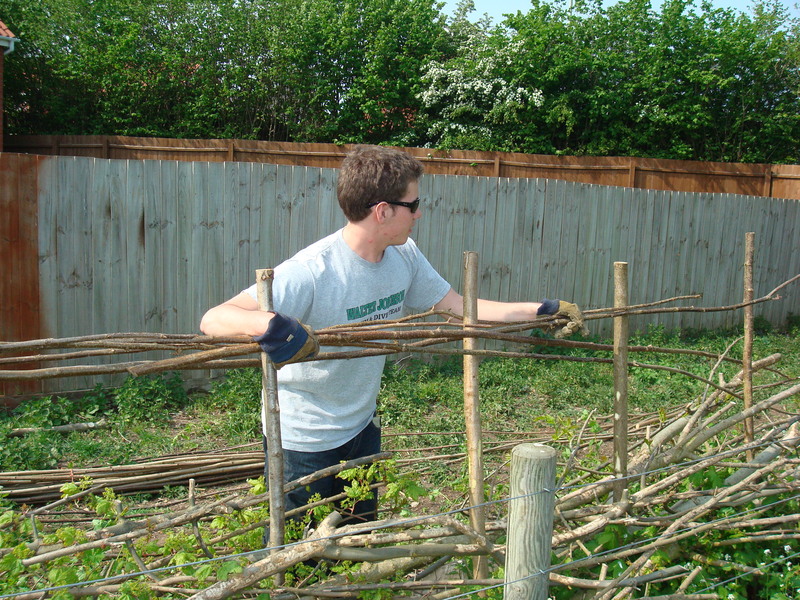 Heathering is the creation of a fence in a decorative and aesthetically pleasing manner, achieved by weaving long branches in and out of stakes that are set in the ground. Our work wasn’t a conservation task, but was in exchange for funding from the local council that will be used to support our conservation efforts. To start, we used a staking ram to drive the stakes into the ground, spaced at even intervals. We had to use the staking ram with two volunteers, one on each side. This was mainly to prevent injury, but also helped us keep the stakes at a ninety-degree angle with the ground. At one point, the stakes were unevenly spaced, so we had to remove them and place them again. At times, it would be difficult to ram the stakes into the ground, because the stake would start to shift to one side or would hit a rock. In any of these cases, the stake had to be removed and replaced. After completing the staking, we decided to take a break for tea and eat our lunches. My supervisor Debbie and I had engaging conversations on the relationship between economics and ecology during these tea breaks. Also, the MP for Norwich South, Simon Wright, stopped by to join us for tea and talk to us about our conservation efforts. 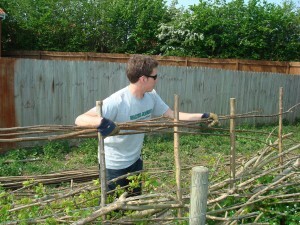 After the staking was completed, we used long branches to heather the fence. To start, one volunteer would hold a branch at one end, and the other volunteer would weave the branches in and out of the stakes. If the volunteer holding the branch let go of it, the heather would fall. Shane, a more experienced volunteer, took the job of weaving the branches in and out of the stakes, while I held the end of each branch to support it. Successive branches were be added at each stake, fitting under the previous branch. Then, all of the branches that had been added were weaved in and out of the stakes. After three or four branches, the tension created would hold the heather up on its own. Heathering was much easier than driving the stakes into the ground, which required a great deal of exertion and coordinated teamwork. However, an endeavor that seemed painless soon became painful. I quickly learned how to identify stinging nettle, after putting my hand through a nettle plant while lifting a branch off the ground. However, my recovery was rapid and I was back at work within a minute. Holding the existing heathering while Shane gets more branches. The heather fence that we created extended about 100 metres, with a gap in the middle to make the marshland accessible to the community. At 1600, with an afternoon of work completed and a little bit of sunburn, we headed back to the BTCV lodge in the van. When I first arrived at BTCV, I had an assumption of conservation work as an abstract concept of action and tasks that are intended to help and preserve wildlife. I didn’t understand that a lot of our tasks were undertaken solely for the purpose of maintaining our other conservation efforts financially. Before I volunteered, I didn’t fully appreciate the degree to which Norwich and the areas surrounding the city rely on volunteers for the maintenance of its public spaces. On the surface, it seemed that our task was merely a means to an end. However, the sense of community and purpose that it gave the members of our group, volunteers with a wide range of abilities and life experiences, was an admirable goal in itself. After having lived in London for a little more than three weeks, I am struck by two facts of the city. The first is that I am extremely excited about the accessibility of art in the city (mostly the theatre). The second is the expansiveness of London. As we’ve read, London was brought together from a number of smaller hamlets and towns. Like an amoeba, the growing London expanded, surrounded, and consumed each village it came to. A good deal of the land was owned by private individuals or the church and it too was eventually incorporated into this growing city. Since there was no real rhyme or reason to the expansion of London, the city is a patchwork of highly urbanized areas abutting parks abutting suburban sprawl. Both of my parents are urban planners and if you were to ask them about London I’d imagine they would compare it to the big cities of the American Mid-West, perhaps akin to the infamous sprawl of Chicago. In their profession, the spreading of urban areas equals inefficiency, a definite negative indicator for quality of life. However, London doesn’t feel slow or congested as most cities with such long computing distances usually do. It has managed to succeed where Chicago fails: it is huge and efficient while maintaining its openness. Even more than any of this though, the thing which most impresses me about London, or rather, what London has most impressed upon me is how little I know about the world. I’m sure that most of the humanities students would agree that we’d like to think of ourselves as well-travelled or at the very least, culturally aware. I know I would, but being in London has made it somewhat hard to keep up that delusion. I’ve lived in Israel twice, for three and nine months, respectively. I’ve been to Hungary and Uruguay. I attend a liberal arts school and I read books. However, the very fact that I was so impressed by London’s parks is an indicator that I do not have the global perspective—especially in terms of what quality of life is actually like in other countries—I’d like to think I do. That’s not to say that London’s parks aren’t amazing, they are. However, I take for granted the fact that they must be exceptional simply because I have never really been exposed to anything like them. Central Park in New York and even the Golden Gate park in San Francisco and Mount Royal in Montreal are nothing compared to the biggest urban parks around the world, some even under my very nose, within the United States itself. A bit of research taught me that Phoenix, Arizona has a 16,283 acre park. Compared with Hampstead Heath at a measly 760, that’s massive. Stanley Park in Vancouver is 1,000 acres. 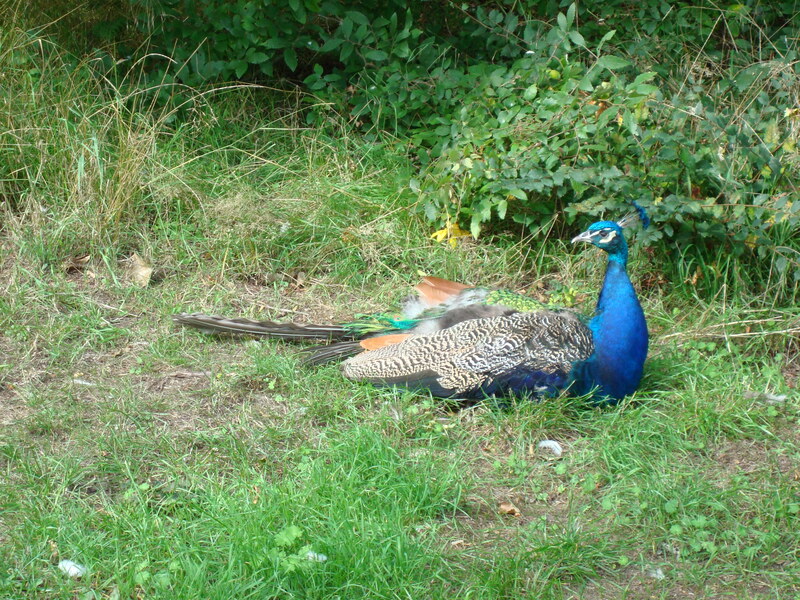 Chapultec Park in Mexico City, Metropolitan Park of Santiago, and Phoenix Park in Dublin are 1,800 acres a piece. A lot of factors feed into how citizens use a park: climate, accessibility, population age and ethnicity, security, and government promotion all play roles in this complex formula. Based on my limited knowledge, London seems particularly proud of its parks and what they provide for the citizens of the city. This is in large part due to something any critic of the class system would balk at. That is, the parks are and traditionally have been gated, controlled environments. Originally this was done to keep out the poor but over time, the rules were loosened and these ‘city lungs’ became much more egalitarian, soon available to all citizens and their livestock. But the gates allow the parks to be closed during the night, thereby keeping them nice for the day when criminal activity is less likely to take place. Today, London’s parks provide to their citizens a natural place of pause in the midst of one of the most cosmopolitan cities in the world. They’ve also provided me some perspective on how people live in other societies. When Durden asked at our alumni event what we’ve seen in London that we’d like to take home with us and incorporate into our own lives, I replied balance. The parks have helped me to realize exactly the extent of the importance of balance between the urban and the natural world and what that balance can provide to a city like London. With sunny skies and a temperature of 20 degrees, yesterday was the perfect day to get out of the museums and visit Kew Gardens. To get to the Kew Gardens tube stop, you take the Northern line to Embankment, and transfer to the westbound District line trains terminating at Richmond. The ride from Embankment to Kew Gardens took a little over 30 minutes, so plan to spend at least 2 hours at the gardens to make the trip worthwhile. After leaving the Kew Gardens tube stop, you must take a brisk five minute walk down a tree lined street, to the Victoria gate of the Royal Botanical Gardens. The entrance fee at the gates is £13.50 for adults, but £11.50 if you bring your student ID. At the entrance, I saw several people showing cards and being allowed quick entrance without buying tickets. Later, when I spoke to a guide I inquired what this card entailed, and the guide explained that many of the denizens of the surrounding area had purchased membership in order to enjoy the privilage of visiting the park for free whenever it was open. Even though the neighborhood by the tube stop was quite scenic and had lots of open public space, it became apparent to me that the ammenities that the park provided made a full membership worthwhile if you lived in the surrounding area. As you walk down the path from the entrance, you are greeted by the sight of a diverse selection of trees from arround the world, neatly arranged in groves to the sides of the path. 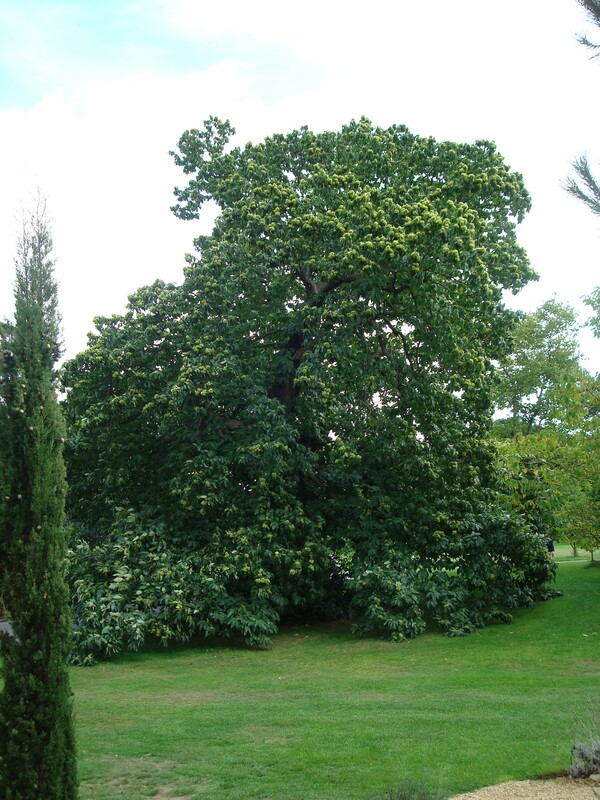 Along the way, I spotted what is believed to be the oldest tree in Kew Gardens, a Sweet Chestnut tree thought to have been planted in the early 18th century. 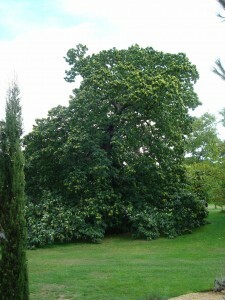 The Sweet Chestnut tree is thought to have been introduced from Southern Europe by homesick Romans who were known to use the chestnuts to produce flour and other edibles. 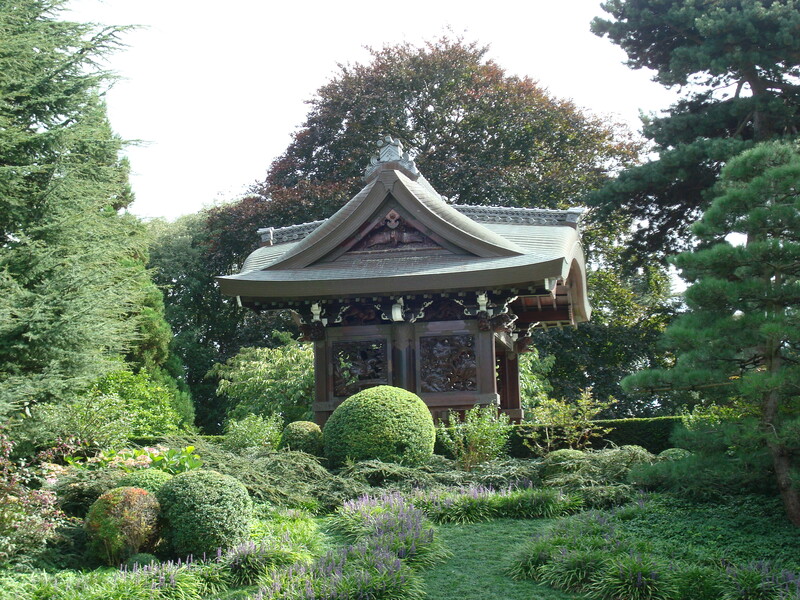 I decided to walk to the southern end of the Gardens, toward the Japanese landscape garden, with a “Chokusi-Mon” replica in the center. Chokusi-Mon means “Gateway to the Imperial Messenger” in Japanese, and this temple was a replica of one in Kyoto. There was also a peacock just chillin’ to the side of the path, next to a bush! Some of the other visitors, who seeing from their accents were British, passed by and made clicking noises to get the attention of the bird. They were not very sucessful, but it reminded me of Kate Fox’s discussion about how Brits like to talk to pets and animals for as a coping mechanism for their social dis-ease. 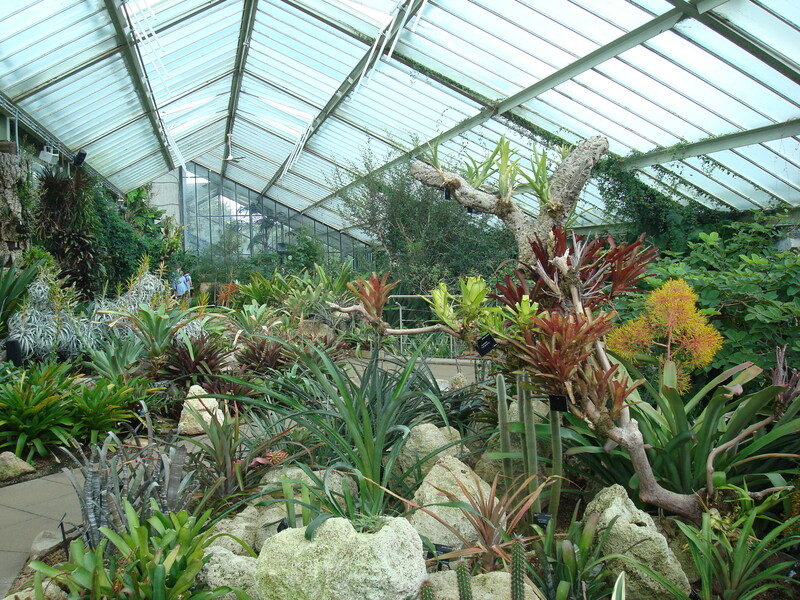 Finally, I visited the Princess of Wales Conservatory, which contained several plant selections from several climate zones, including a Tropical Rainforest, Desert, Tropical and Temperate Ferns, and an Orchid room! There were live butterflies in several of the rooms, but I couldn’t take any pictures because I used all of the spare memory on my camera. If you are ever in London again, and want to escape the bustle of the city, go to Kew Gardens! Whenever I see green it makes me so happy. I guess it has a lot to do with the fact that I grew up in really big city, so I didn’t get to see green on a regular basis. In Brooklyn, a park consists of a playground set, and a basketball court. You might get the occasional tennis or handball court, but as far as endless acres of green land…dream on! I would have never expected London to have so much green area being a highly developed, bustling city…but I was so wrong. London is so beautiful, which is another reason why I love it here. There is a balance between man made and nature, and while it is nice to live the city life, it is also necessary to get away sometimes and just take a stroll in the park, and not just Central Park (angry New Yorker), but have a variety of great parks to chose from. Not only are the parks beautiful, they are also so clean and well maintained! 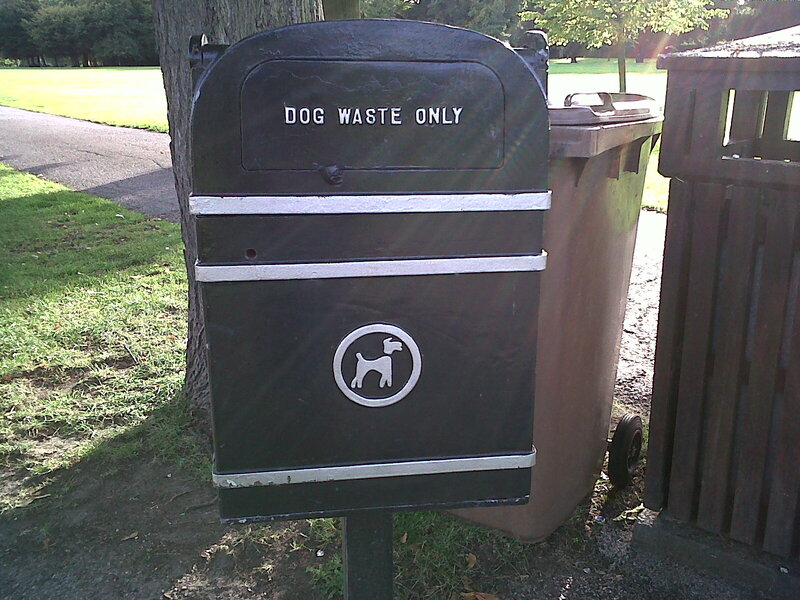 You can tell that residents respect the parks here and abide by the rules of sanitation. 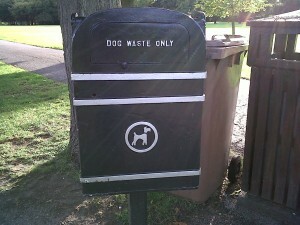 There are even “dog waste only” rubbish bins scattered around the parks, something that is definitely needed back in the states. 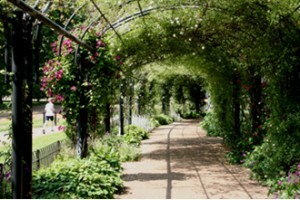 My favorite park would have to be Regents Park. 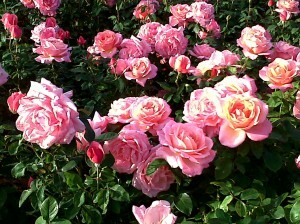 In addition to its endless seas of green, I really loved the Queen’s Rose Garden. I don’t understand why flowers make girls so happy, but they give me a warm fuzzy feeling inside that I can’t explain (LOL). Sarah and I lost all concept of time as we wondered through the garden, mesmerized by roses of all different colors, shapes, and sizes. There was also a pond, and a waterfall, and couples smooching everywhere, which made us gag, but I guess one would say that the garden set the scene for a romantic getaway. Other than the rat that we saw running through the flowerbeds, it was perfect. It was great to see a very diverse crowd enjoying the afternoon in the park. I saw all races, and ages, laying in the grass, playing games, or just strolling along the walkway. I guess enjoying the afternoon in a park, surrounded by green, is something that almost everyone shares in common. If you don’t like parks, then I guess your just weird. It took me quite a while to get around to investigating the parks in London. I think most of this is because I had already been to Hyde Park when I was younger (i.e. less interested in such things) and because I was trying to go to so many museums and city-related destinations that I didn’t really think I had the time. Another unconscious reason, I suppose, is that, while I do love Central Park, I just didn’t really think that parks in the middle of a city would be much to write home about. But I was wrong. While getting caught up in the crowds and the bustle of the city, I completely forgot to, literally, stop and smell the roses- if you’ll forgive the pun. I know everyone I spoke to on the subject had the same experience, but it truly is amazing to walk a few minutes away from the city and find yourself completely surrounded by green. Kaitlin and I decided to get some take away from Harrod’s and bring it to Hyde Park to eat, and we walked straight out of the city and into the rose gardens. (First we had to pass a horse riding trail. It was amazing!) Once you travel farther into the park, it’s even easier to forget that Harrod’s and Knightsbridge are only a few kilometers away. And Regent’s Park, that’s another story entirely. We got off the tube, walked down an upper class residential street, and wound up in what seemed like an entirely different part of the country. With playgrounds, huge green fields, trees, ponds, rose gardens, and high hedges, it is entirely possible to forget that you are in a huge, busy city. I know it sounds pretty cliché, but it really was fantastic to get back in touch with nature after so seeing much brick and stone day after day. I could have sat and watched the swans swim and stare at the flowers all day. Unfortunately I was only able to spend a few hours in the parks, but it was an amazing diversion from busy city life. And today at Hampstead Heath was completely gorgeous. Some of the girls and I had to take the time to frolic through the fields because we’ve missed nature so much. Even though I initially dismissed the importance of the parks in London, I loved seeing so much green in the middle of the buildings. And because there aren’t so many skyscrapers in London, it was much easier than expected to forget I was in the city at all. No traffic noise, no pollution, no impatient drivers or pedestrians; just nature, for as far as I could see. 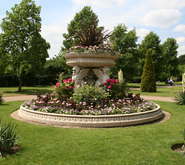 The parks of London provide a natural respite from the busy, hectic, and stressful atmosphere of the city. Once in them, you are enveloped by a green tranquil, unable to hear the bustle of cars and people outside the parks’ confines. I have personally experienced this phenomenon at several parks, ranging from Regent’s park (where I ran for the first time since surgery! not a bad debut location), Hyde Park, and most others. This type of division between hustle-bustle and repose mirrors the separation of work and play that Fox often talks about. However, there is also a clear division within the park of activities that mirrors this division of social and work life. There are areas for sitting contemplatively in very silly chairs, which you are supposedly required to pay for. 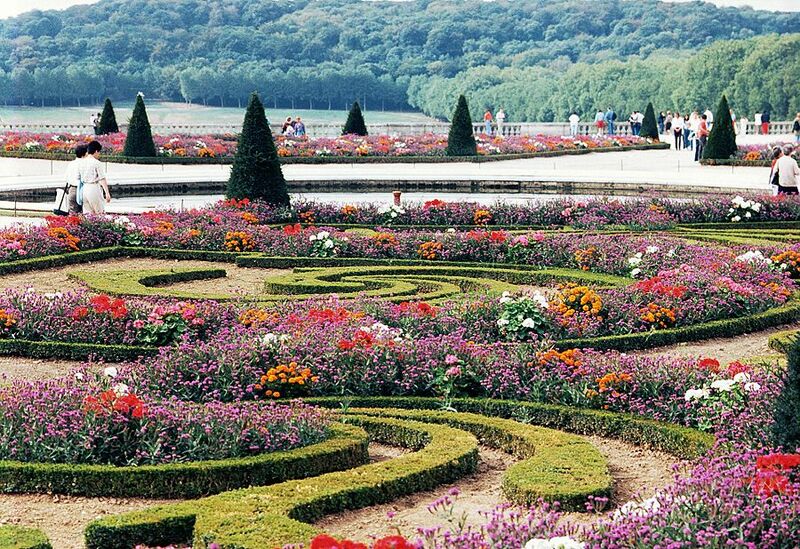 There are areas for looking at quite nice fountains, sculptures, or gardens. Then there are designated areas for sports, with soccer nets and rugby… posts? Tennis courts seem a bit necessary to be fenced off for convenience’s sake. Several little cafés are sprinkled throughout the parks as well. Regent’s park matches the above description. I’ve made several trips to this park to run, play a bit of ultimate, have a cup of coffee, or just stroll around and look at the great horticulture. However, all of these activities would occur in different locations in the actual park. This segments the activities, and consequently divides the people that enjoy different forms of recreation. Personally, it made me very uneasy. If I were to throw a disc in the wrong area, I risked getting publicly reprimanded (as classmates have experienced). Anyway – it would take quite a bit of time for me to analyze this division (and I really don’t have the experience or expertise to do so) but there has to be some sociological effect. If you have thoughts on this, just comment on this post. However, not all parks match this model. St. Jame’s park, home of many venereal diseases during the restoration period, per Dennis’ description, is seemingly built for nothing but comfort and relaxing. There are nice little walks along the lake, a couple bridges, some out-of-place fowl, and many large grassy areas upon which you can sit. However, in a couple walks through the park, I never saw anyone playing catch, football, or any other sport in these large areas. Though it was suspiciously absent of proper monuments (at least, I didn’t see many), the website is careful to highlight the pelican feeding from 2:30-3, and the deck-chairs. Weird. More leisure activities. I should note that there is a quite disproportionately small playground for children. However, as a whole, this is not a built-for-fun park. 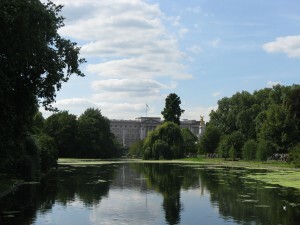 It is a built-for-relaxing-park, and I think is such because of its close proximity to Buckingham Palace. 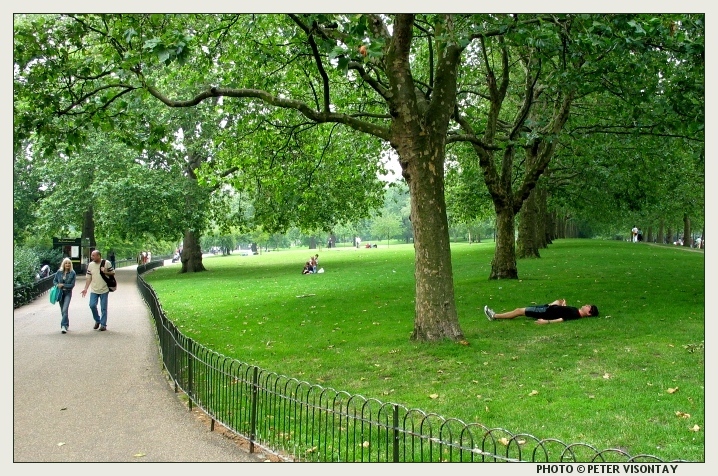 Green Park, also bordering Buckingham Palace, mirrors this model of relaxation, rather than recreational, with a few monuments (such as the Canada memorial), and is a bit more open green spaces rather than pathways-and-lakes. To me, these two parks are just not okay. I envision parks as a place where you can run around, play whatever kind of games you want. 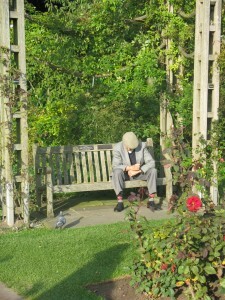 Having fancy gardens in parks just seems to counteract this. 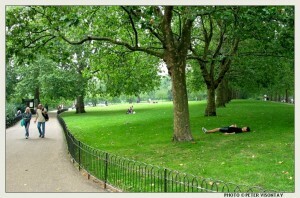 Hyde park, the last park I will discuss in this post, blends athletics and relaxation much like Regent’s. And, just like Regent’s, different activities are segmented. There are different areas for sitting in lawn chairs, areas for tennis, I’ve seen people playing soccer on some of the larger fields (quite far away from the chairs, mind you), and the notorious Speaker’s Corner, completely ostracized from any central location. I suspect that its location is completely intentional whatever authority governs the parks wanted to make sure the… colorful characters that frequent the corner would not pollute (in their mind) the rest of the park. Well, the parks are divided not only from the city but often divided within themselves. What effect this has on the psyche of park attendees, I’m not sure. Though I love the idea of having large parks in cities, I don’t like this division. If you want to have fancy gardens, just don’t call the whole thing a park. That these two photos (both personal) came from the same park (Regent’s) makes little sense to me (though the picture from the right, in my opinion, should not even come from a park). I used to think that William Wordsworth was kind of a sap, always going on about daisies in a field and all that in his poetry, but since arriving in London, I’ve come to respect his stance a lot more. I still think that Wordsworth is a bit melodramatic, but I understand his need to remember images from nature. I grew up in rural Connecticut, so I’m used to seeing cows, fields, and woods all on my two-minute drive to the center of town. Before this program, I had not spent more than three consecutive days in a city, and I can honestly say that the parks have kept me sane. London is a wonderfully dynamic city, but it’s also exhausting, and I think that the parks here are an absolute necessity for the people who live here. London, like any major city, is loud, chaotic, fast-paced, and extremely crowded. Walking down Tottenham Court Road is an exercise in agility. Weaving through people all of the time, especially tourists who stop short to take photographs or consult maps, can become extremely frustrating. But inside of the parks, the bustle of the city seems much farther away. In Queen Mary’s Garden at Regent’s Park today, I was almost able to forget that Marylebone Road ran just outside of the gates. It’s quiet, and you can actually hear the sounds of nature. Although some parks undeniably attract more tourists than others, I saw people just laying on the grass sleeping, reading, doing absolutely nothing at all, in all of the parks that I visited. I think that people are just so relieved to be out of the insanity that is London’s streets that they can’t resist the opportunity to sit down and enjoy a quiet moment. 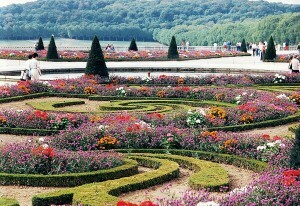 This is reflected in the development of the parks, as well. Regent’s Park and St. James Park were both made into hunting grounds by King Henry VIII, but they’ve become beautiful, public green spaces. 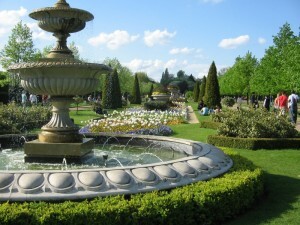 Hyde Park and Kensington Gardens really were formed due to necessity; Queen Victoria decided that the public could really use a park to combat the crowded, polluted conditions of a newly industrialized London in the nineteenth century. Wordsworth fell at the beginning of this time–in his day, London was just beginning to become an industrial power, and we can be fairly certain that his description of the city in his poem “Composed Upon Westminster Bridge” were not completely accurate. Wordsworth sought out beauty in nature because he was suffocated by conditions in the city. Yes, some of the gardens seem a bit contrived (the bridge at St. James Park just happens to offer beautiful, leafy views of both Buckingham Palace and Whitehall), but the English do love gardening. And today in Regent’s Park I saw people ambling slowly through the very well-manicured rose gardens, literally stopping to smell the flowers. 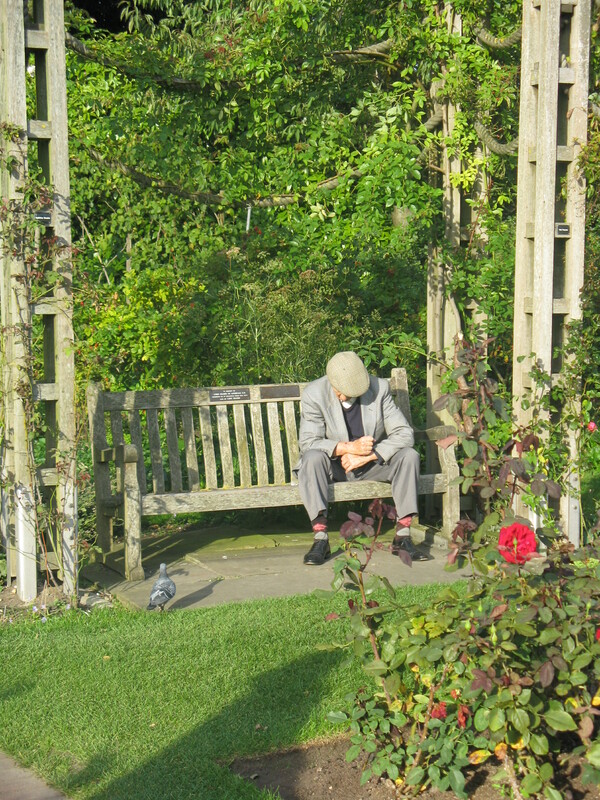 Couples were cozied up on benches, people were reading under weeping willow trees, and one gentleman was just conked out in the sun. As I walked down the avenue, I noticed people sunbathing and playing a football match, also a common sight in Hyde Park and Kensington Gardens. No one, regardless of whether or not they were tourists, was in a hurry, and that’s exactly why the parks here in London are so important. People just need an escape from the city for a bit. 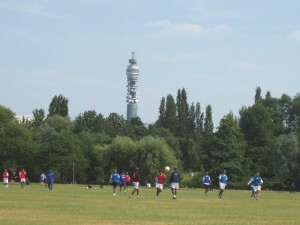 This afternoon myself and a friend visited Regent’s Park to have a bit of footy in the sunlight. The day was beautiful, and the park was breathtaking. 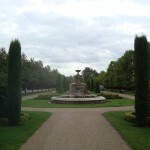 Being my first visit to Regent’s Park, I can honestly say I could have spent days there. The major difference between Regent’s Parl from the other park that I have spent the most time in, St. James Park, was the awesome, gigantic field space used for sporting activites or “ball games”. We spent time in both the large, sport dominated field area as well as the walking route among the gardens and fountains of Regent’s Park (I would have several lovely pictures for you all of our leisurely day, but sadly I left my camera in the hotel upon departure). In comparing Regent’s Park to St. James Park there are a few key differences. 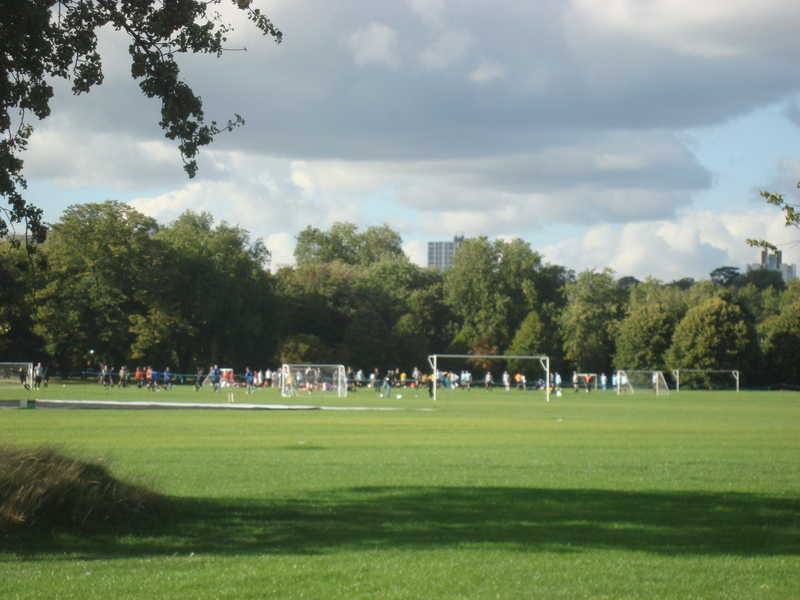 Regent’s is divided into two sections, the “ball games” field section and the walking route (which has a few little subsections). St. James only has the walking route. Both are beautiful, St. James seemed a little bit more open in the strolling section, and had a little more to offer visually in terms of natural elements (it’s on that fantastic lake and has all those birds running around, it’s hard to beat the pelicans). 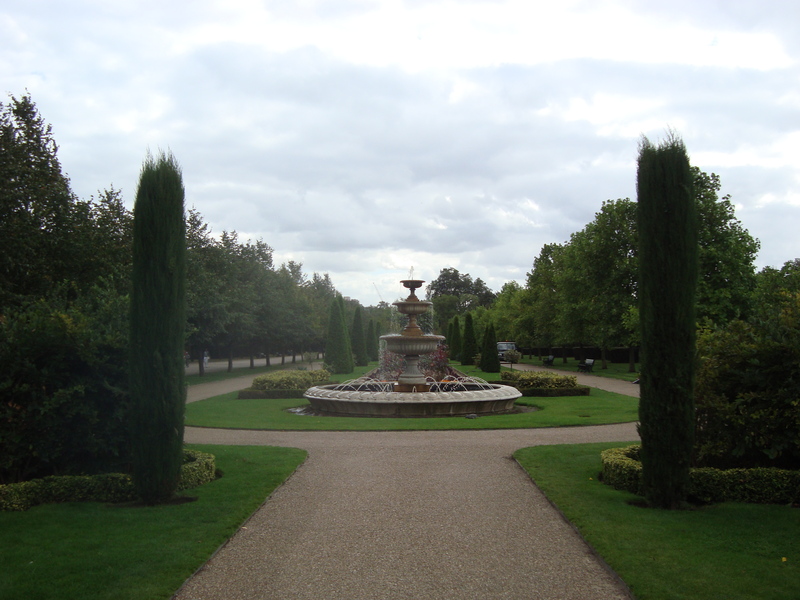 It seemed like perhaps more manmade work had been done in Regent’s however, the section that we strolled through had several beautiful fountains and well placed gardens, giving it a very tranquil and calm feeling (not as many people either). I could go on for days about how beautiful and elegant these parks were, but I want to discuss what their purpose actually is in British society. The Brits put a lot of pride in three things: museums, churches, and PARKS. These parks all have had one or more notorious architects working on their designs and perfecting them over centuries. They are signature landmarks of the UK, world famous Brits and royalty have worked through them over hundreds of years. Why? Like I said in my blog about the purpose of pubs in British society, it seems like when the Brits aren’t living the hustle and bustle lifestyle of London, in packed tube cars and crowded streets, they like to take a minute to value their time with others and the so called “simple things” rather than spend their time playing watching television or on their computers, like Americans. 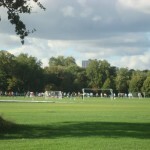 The Brits are generally doing one of the following things during their visit to the park: walking their dog, chatting with a friend, having a picnic, kicking around the old football, or just having a stroll. All simple, leisurely activities that you don’t need to pay a cover charge for. These parks have so much money and effort poured into them because most of the population of the UK treat them as a national treasure and use them so much. They are a significant part of the history of England. Cheers.